For maximum weather protection our roomy Sequoia is available in a Gore Windstopper™ 830 shell for extreme weather protection. 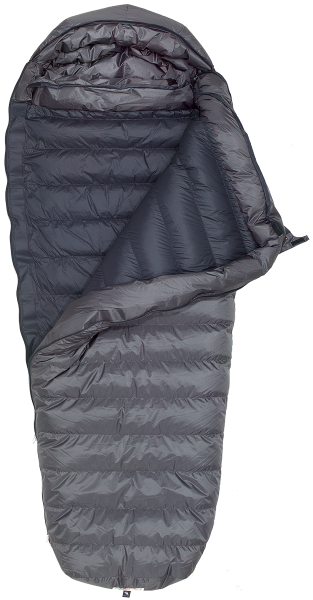 The Gore Windstopper™ shell is the most water resistant-breathable fabric suitable for sleeping bags. In the Gore Windstopper™ bags you’ll find the down filled collar and draft tube are constructed with Gore Windstopper™ fabric for all of its parts. These Sequoias have a full down collar solidly stuffed with down to provide a protective seal from the bellows effect as you move about inside your bag. The continuous baffles allow you to adjust the down fill to suit the changes in weather. Its two zippers not only allow you to zip to mummy bags but also to unzip the foot so that it can lie out flat. Our Sequoias are your best friend when you need room during the most weather prone climates.